Proprietor of Global Seafood Distributors and Chairman of the African Cultural and Development Association’s (ACDA) fishing committee, Allison Butters-Grant. Plans are underway to build a multi-million dollar fish-processing plant at Victoria, East Coast Demerara where at least 200 direct jobs could be generated. 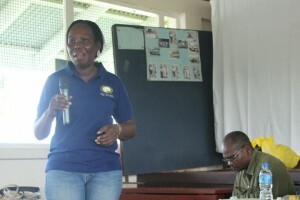 “We won’t be able to hire everybody out of Victoria but there will be a need for employment of people from the area,” Proprietor of Global Seafood Distributors and Chairman of the African Cultural and Development Association’s (ACDA) fishing committee, Allison Butters-Grant told Demerara Waves Online News. Grant hopes to complete the construction of the fish processing plant next year on land hat she has already secured in that village- located about 18 miles east of Georgetown and was the first village that freed African slaves bought in 1839 by pooling their resources. Grant, who studied Good Manufacturing Processes at Cornell University, hopes to train her workers in those standards in collaboration with the Food and Drugs Department and the Guyana National Bureau of Standards. “We are hoping to certify our employees to the level of having the Good Manufacturing Practices,” she said. After meeting top class US standards, Global Seafoods, which currently targets the Guyanese Diaspora, intends to break in to major American distributors such as Walmart, Stop and Shop, and Whole Foods. With Guyana Power and Light’s electricity cost being high and unreliable, Butters-Grant said her company would be exploring the various options- fish-waste bio-diesel, solar energy or fossil fuel self-generation. “The biggest cost other than rent is energy and the economy isn’t able to offset that,” she said. She would be taking advantage of easy access by coastal fishing boats to deposit their catch for processing and sale on the local and international markets. She said she opted to locate her fish processing plant at Victoria because there is where she acquired reasonably priced land. “It wasn’t a matter of Victoria being special. Of course, Victoria is special. It’s just a matter of what will be strategically available to the type of business that I am investing in,” she said. At the community meeting hosted by ACDA at Victoria Saturday 12, 2016 representatives agreed that a thriving village fishing industry could foster the establishment of a village fish processing plant. This was especially emphasized as sections of the village particularly the farming sector, expressed great interest in providing auxiliary services to the industry. ACDA is interested in resuscitating once competitive and lucrative village businesses that have visibly dwindled over the years. The fishing industry is being touted for East Coast Villages that have easy access to their work environment. She noted that only three fishing boats are associated with Victoria compared to more than 30 boats at Hope, East Coast Demerara. Butters-Grant has volunteered her time to aid in this area at ACDA’s request. She reiterated to attendees at Victoria’s Community Centre, Middle Walk that the fishing industry is a multi-billion dollar one that requires other services. “From the water to your pot or pan, there are other services that must be provided.” Speaking specifically to the artisanal fishing industry, Butters-Grant pointed out that boats have to be made, the fishermen would need food from farmers to take to sea, fishnets and fuel are a few services required. “These are all additional services that accompany the industry,” she said. It was agreed therefore that the fishing industry has various opportunities food persons involved in various sectors. Names and numbers were exchanged as the meeting’s participants expressed interest in the industry. The next time the community meets with ACDA, it is expected that they would begin to realize plans for financing and management to be provided to villagers. Butters-Grant was accompanied by other prominent persons representing various organisations and government agencies. They included Eric Phillips, a principal of ACDA and Chairman of Guyana’s Reparations Committee, Neilson McKenzie from the Ministry of Public Infrastructure, Gary Baird from the Ministry of Agriculture’s Fisheries Department and former Minister of Agriculture Dr. Simpson Da Silva.